The NGO's £45 Membership Subscription includes public liability insurance for up to £10 million whilst taking part in any listed gamekeeping or shooting activity for leisure purposes. 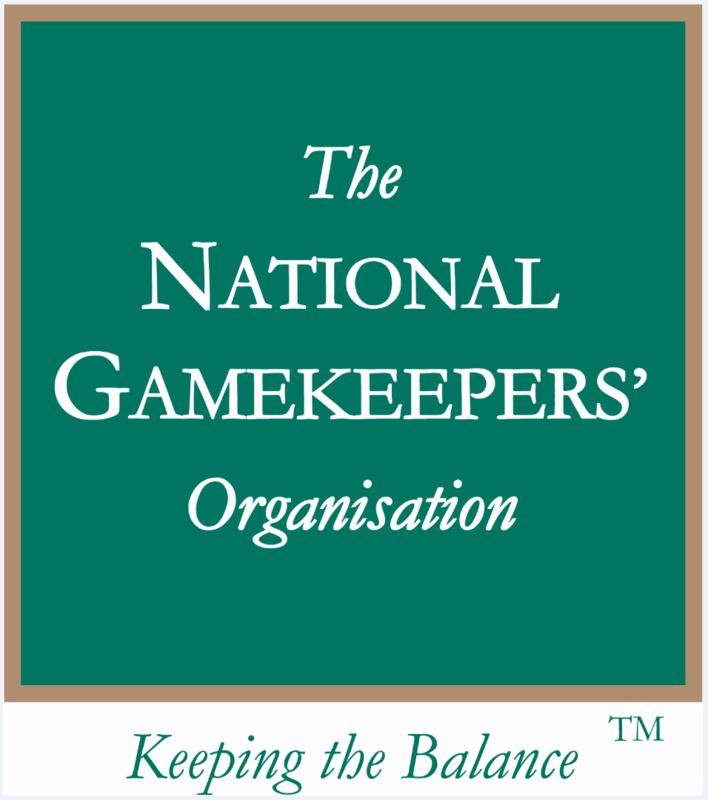 The NGO's £45 Membership Subscription includes public liability insurance for up to £10 million whilst taking part in any listed gamekeeping or shooting activity for recreational purposes as well as covering you whilst earning no more than £5,000 per annum through shooting (including carcas sales). It gives you peace of mind that you are insured, if not already covered by another insurance (eg household) that you hold. We find that this certainty is all that most of our members require but if you do want more (eg cover for your dogs or for shooting abroad), our brokers, Lycetts, will be pleased to quote attractive NGO members' rates. Our general NGO members insurance is provided through a policy issued by the Royal & Sun Alliance Insurance Ltd, AIG Europe Ltd and Covea Insurance Plc through Lycett, Browne-Swinburne and Douglass Ltd. NGO members are covered up to £10 million public liability whilst taking part lawfully in any recognised gamekeeping/fieldsports activity endorsed by the NGO* for recreational purposes only and if not covered by any other insurance. The Territorial Limits under this policy are: the United Kingdom of Great Britain and Northern Ireland, The Channel Islands and the Isle of Man. The policy has a £250 excess for each and every loss in respect of Third Party Property Damage. This cost will be borne by the claimant. Royal & Sun Alliance Insurance Ltd, AIG Europe Ltd and Covea Insurance Plc through Lycett, Browne-Swinburne and Douglass Ltd.
Who is covered and for how much? Members covered include full-time, part-time and amateur gamekeepers, retired members, individual supporter members, honorary members and student members. The cover is up to £10 million for any one incident. Is there any excess which I would have to pay in the event of me making a claim? Yes. The policy has a £250 excess for each and every loss in respect of Third Party Property Damage. This cost will be borne by the claimant. Rough, walked up and driven shooting, wildfowling, stalking, vermin and pest control, clay pigeon shooting, fishing, field trials and target shooting 'for recreational purposes only'. Is my dog covered for public liability whilst out working with me? Yes; but only if your dog is out working with you whilst you are conducting any of the above named field sports activities for leisure purposes only and it causes injury to a third party or damages third party property. However, this does not cover any injury to the dog or veterinary fees incurred as the result of the claim. Am I covered for shooting abroad? No. The Territorial Limits of the cover are The United Kingdom of Great Britain, Northern Ireland, The Channel Islands and the Isle of Man. On referral to Lycetts, however, cover can be extended on request for individual members' making short field sports trips overseas. If I am injured or my property is damaged will I be covered? No. Personal injury and damage to personal property is not covered. The insurance provides Public Liability cover only - in other words if you were to injure somebody else or damage someone else's property. Am I covered if I am at work and employed by someone or self-employed? If you are being employed by someone, whether paid or voluntarily, they are legally required to provide Employers Liability insurance to cover you in the event of you sustaining an injury whilst at work. It would also be usual practice for the Employer to have Public Liability cover, which would respond to injury/damage caused by you to third party property / bodily injury, whilst under their direction and control. We recommend you check this with them. If you are a self-employed keeper, stalker or ghillie earning over £5,000 it is advisable for you to have your own independent stand alone insurance cover for both Public and Employers Liability. This is available at a pre-discounted premium for NGO members through Lycetts.The NGO insurance is for recreational activities only in a non-professional capacity. If I receive payment in kind, am I still covered? Yes. 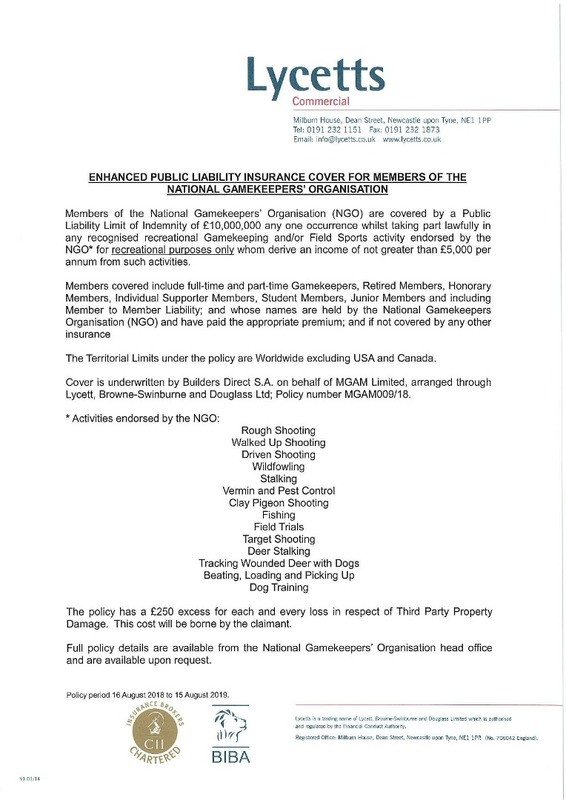 You will be covered if you are taking part in any lawfully recognised recreational gamekeeping and/or fieldsports activity endorsed by the NGO for recreational purposes only whom derive an income of not greater than £5,000 per annum from such activities. How do I stand if I have other Public Liability cover, i.e. through another shooting organisation or home insurance? Royal & Sun Alliance Insurance Ltd, AIG Europe Ltd and Covea Insurance Plc state in their confirmation of insurance cover that you are only insured "if not covered by any other insurance." What proportion of my membership fee goes on my insurance cover? Approximately £3.50 of the membership fee covers the Public Liability premium at present. Does the NGO provide insurance cover for syndicates and clubs? Members of a club or syndicate are welcome to join the NGO. Each particular member would be covered by the Public Liability insurance cover whether out shooting with the syndicate or club or elsewhere. However the insurance covers only the individual and would not cover guests or beaters or any liability incurred by the syndicate or club itself. The insurance required to cover these additional liabilities is available to NGO members at a pre-discounted rate through Lycetts. The above questions and answers are for general information purposes only based on the most frequently asked questions and are only intended to provide background information on how the policy works. It is not a summary of the policy wording, and does not constitute the provision of any advice. If you would like specific information with regard to the Public Liability insurance cover which comes with individual NGO membership, or are interested in any additional cover or covers outlined above, please telephone Ann or Ellie at the main NGO office on 01833 660869, who will be happy to let you have the contact details for Lycetts. Lycetts is a trading name of Lycett, Browne-Swinburne & Douglass Ltd. (Reg No. 706042 ENGLAND) which is authorised and regulated by the Financial Services Authority (FSA No. 310623).